Lucky me, as the wife has kindly let me out for a night and just before we go away on our holiday. The conditions look very variable, how could I refuse such an offer? I was planning on going on the Airfield lake, just for one last go in that swim. But I also fancied a drive around the Meadow lake on the way down for a look about. 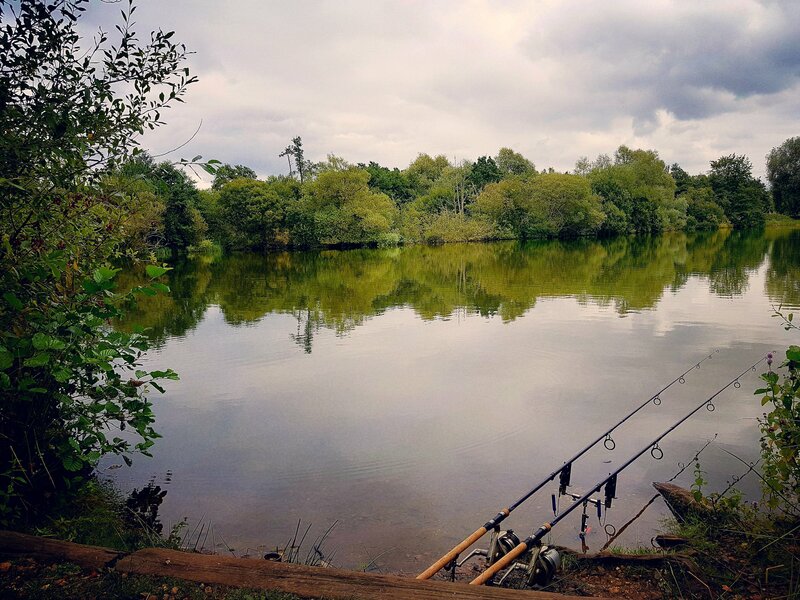 After a chat with one of the other syndicate member, this lake was still fishing OK but slower than when it first opened. 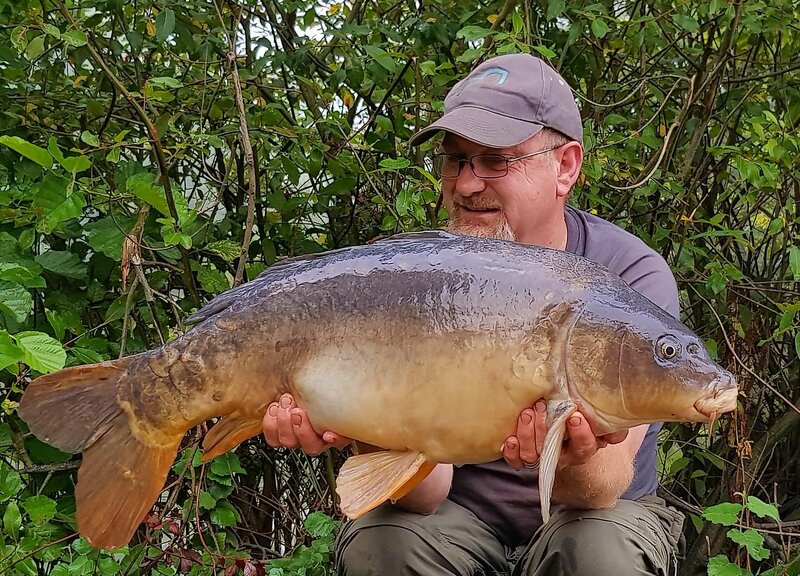 The average weight was good coming out and after catching a load of small fish, it was time for a change. I settled on this swim as my other two options I fancied where full. The only trouble with this swim were that there were way to many options. As I didn’t want to maker around too much, I opted for the area I had fished before as a starting point. I marked around that area a bit more, I was looking to fish one rod on the drop off and the other on top over the plateau. I was going to have a load of catalyst pellets and Betafin Pellets soaked in CSL Liquid. This is something I am starting to play with for the Winter on this lake. I also Spombed out a kilo or so of Catalyst boilies. All set up at the end of the point, the wind will be pushing down here soon. 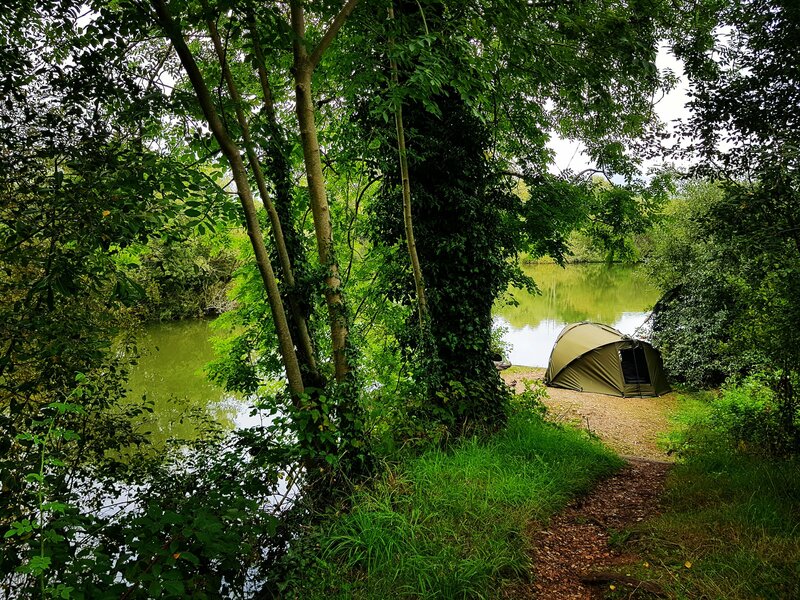 I was happily watching the world go by, when the left hand rod pulled the bobbin up to the top, as I was using back lead, the rod tip was banging up and down. I quickly pulled into the fish which was kiteing hard left and was going to cause me a big problem if it got between me and the small island next to me or even behind it. I was pumping the fish towards me and finally got it under the rod tip, I was happy to let in plod about for sometime, until I slipped it over the cord. With rod re-baited and back on the same spot. I Spombed out a couple more times to keep the swim topped up. I needed to hold the fish there hopefully as there were plenty of angler’s fishing tonight. I had to wait until 0330 before the next rod went off and this time it was the right hand one and this fish was determined to go around the left hand side of the point. I was forced to dip the rod under water and hopefully avoid the over hanging tree. With my back lead on the bottom, I just about did. After its’ second lunge off I got the fish in front of me, I clipped the branches of the tree but luckily it came out with no difficulties. It was now safely under the rod tip and trying its best to charge up and down the margins. Not a happy fish but soon in the net again. Another low twenty, which is nice. 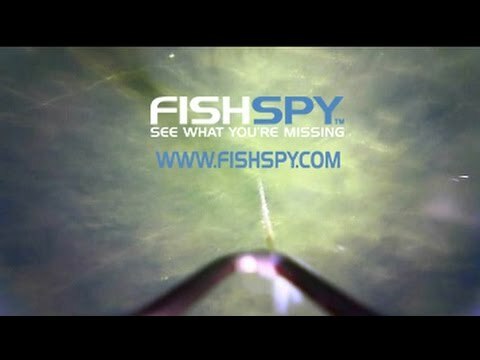 I redid the rod, flicked it back onto the baited area and had a look at the pics and the video. On the video it had the mist and light rain blowing by. It looks great! My next came at around 7 am and was also on the right hand rod. It also tried the same stunt as the previous fish. However, things are so much easier in the daylight and the tree was negotiated much better and a nice mirror slipped over the cord. 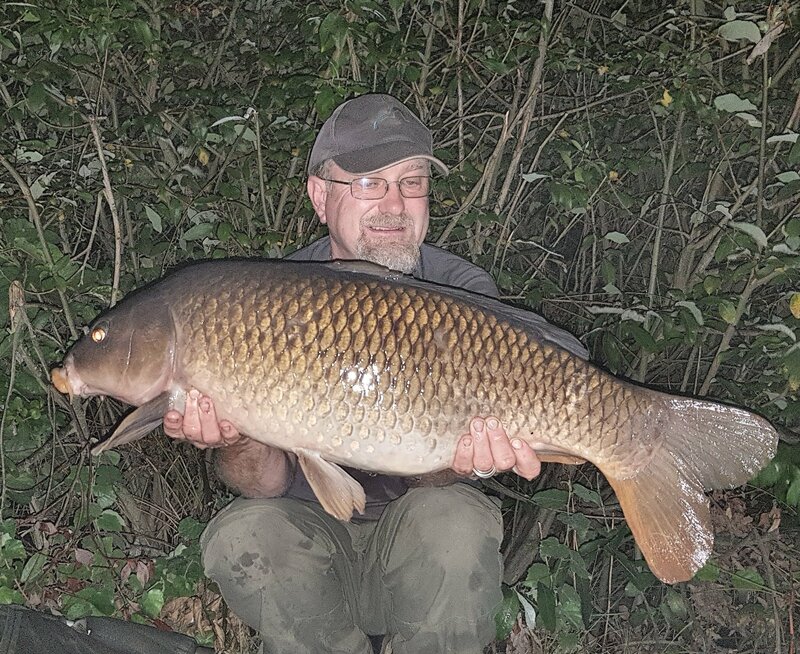 This one was just under 20 lb. It’s so nice to see a mirror, as the other lake is 95% commons. That was a nice session and a good way to finish before my break.